The CX and HD counters (backside of the small and BIG concealment counters) are one of the best counter improvements. Use a text marker pen that is waterproof and mark the Allied CX and HD counters (Allied: Russian, American, British, Chinese, Allied Minors and French) with a small red line under the CX and HD, while the Axis CX and HD counters are not marked at all (Axis: German, Japanese, Finnish, Hungarian, Swedish, Axis Minor and Italian). The good thing about this improvement is that you can easily see what type of nationality is under the CX counters, and say for instance that it is the end of the Russian Player Turn, the Russian player simple take a concealment counter from the pile of counters not in play without having to flip it over to look if it is a German or Russian concealment counter, and time of play will even be speeded up when setting the counters back to its storage compartments (like I did with the counters on board 1, see picture). 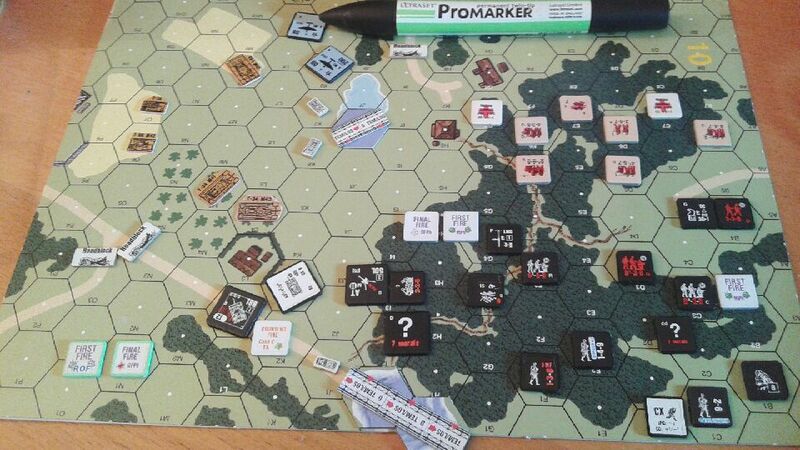 Sometimes you might play Finnish (or Romanians) fighting against the Germans and neither side will have any of their concealment counters marked, no big problem since we have been used to it for years, and these type of scenarios are rare - perhaps 1 out of 100 scenarios played. Use a red text marker pen that is waterproof, and mark the three numbers on the unbroken side of Russian 6-2-8/3-2-8 and American 7-4-7/3-3-7 and also mark the broken morale number on the backside of these counters. 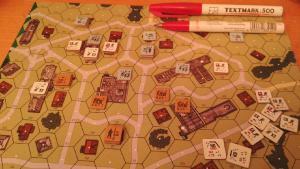 In the very beginning when playing Red Barricades we used Russian 6-2-8/3-2-8 that had the alphabet letters (A,B,C,D,E,F,G,H,I) and all other 6-2-8/3-2-8 were considered non-Assault Engineer units. 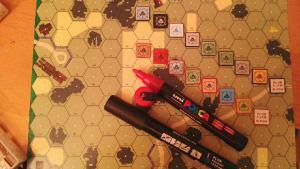 Until we for about 12 years ago started to mark them with a red waterproof text marker, that satisfied or need and reduced the micro-management needed during play. Then for 6 years ago, VotG was released with Russian 6-2-8/3-2-8 AE that had cool DC symbols in the upper left corner and the E letter in a circle, but during play if you had a concealment counter a little bit off (often the case), my opponent could say - ah!!! I see you have purchased Assault Engineers. 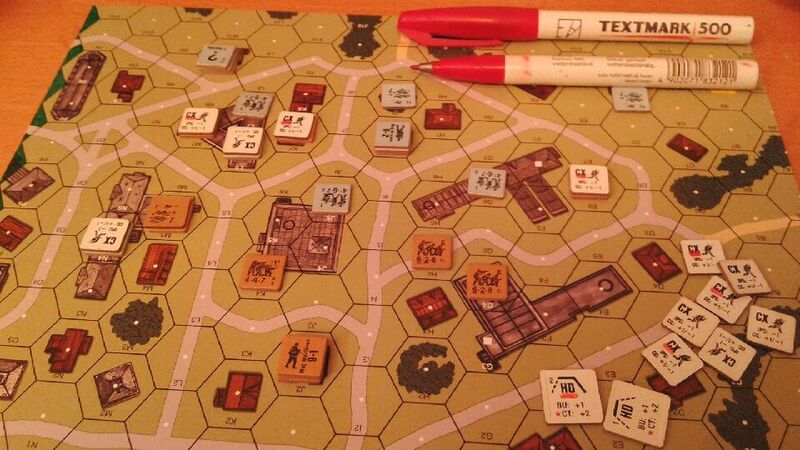 Shortly thereafter these new counters was put away as quickly as they had been brought into play, and the old solution red-marked AE units that we had never experienced any problem with was sent back to the front. The only other nation I felt a need to have red-marked as Assault Engineers are the American 7-4-7/3-3-7 that have been used in a handful of scenarios when there is a mix of these Para-units (AE and non-AE). There are other ways you can use the red text marker pen, as can be seen in the picture the MOTION counter that has both of its vowels in the word MOTION marked red is a simple way to say that on the backside of that counter is REVERSE MOTION printed, while the unmarked MOTION counter tells you that on the backside of it the word Immobilized is printed. you can use AFVs with id A,B,C and red marked id A,B,C and if there is an Armor Leader simple record Armor Leader in AFV id B or in AFV with red id B, and the same goes when the Smoke is depleted. Have used this red marked even for some German, British and American AFVs but mostly used for Russian AFVs when needed. The Russian Sniper that is completely red on the picture has its front side (not the sides another type of pen is used for the sides) colored in red, used for Red Barricades since you use two different Snipers for each side. NOTE: A bit of warning as you can see in these counter improvements recommendation 1-3 this text marker is not good at all to use to mark the sides it will easily get dirty quick quickly and will never look good. The two snipers on the pictures have had their sides painted (not marked) with a special type of pen with a ball inside of it and with a color liquid that best can be described as paint (i.e., it covers all that is marked=painted). 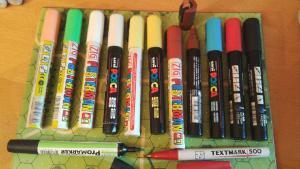 The first I used was a Pen called ZIG POSTERMAN water based pigment ink Kuretake Co., Ltd.
Made in Japan, while the other is called uni POSCA Mitsubishi Pencil Co., Ltd, UK contact Worcester. I have lately purchased them in a store in Stockholm called KREATIMA. They dry very quickly when used (within 10-20 seconds), if not dry shortly after you applied the paint you have bought a similar look alike pencil used for white board that will never dry and destroy the counters. Blue German, Black German, Swedish, Finnish, Hungarian, Axis Minor, Italian, Japanese. Brown Russian, Red Russian (see 3. above), Chinese, Allied Minors, British, French, American. They have been painted to highlight their presence on the playing board, and the wear on tear on the sniper counters I assume have decreased by 80-90%. Snyggt! Tack för att du la upp det igen. Ett tjog förslag till kommer de närmaste veckorna. Under en uppgradering av forumet för ett tag sedan försvann flera filer däribland denna. Flera personer har frågat det senaste året efter filen som skrevs 2006 och korrekturlästas av Klas, som tyvärr ingen av oss hade kvar i sparad form. Tänkte att nu skriver jag den andra versioner och då kommer en handfull med andra förbättringsförslag komma med som ej fanns med i den första versionen. Edited by CTABKA, 23 October 2014 - 08:12 PM. give them a more earthbound feeling to the counters and make them more sturdy along the edges. But for game purposes there are no real benefit to gain at all, so in this case its main purpose to do this to a couple of hundred counters are mostly for esthetic reasons. Känner att det börjar bli dags att beställa färgpennor. 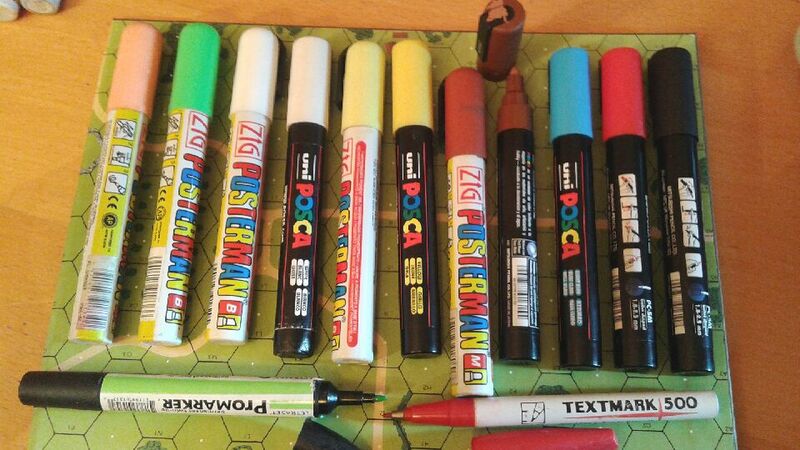 uni POSCA Mitsubishi Pencil Co., Ltd, UK contact Worcester. Both Manufactured by Japanese COYs. 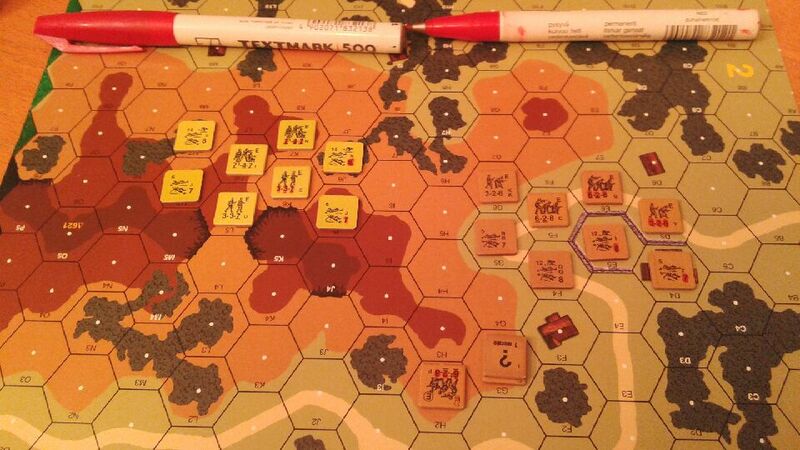 I have colored the edges of the Level 1 / 2 counters with this Light blue pencil. Also used a sharp model-knife and cut out rubble (stone and wooden) counters to a thin paper piece that also is reduced in size and glued onto both sides of the level counter so it almost look like an octagon, made two Upper Level stone rubble counters and two Upper Level wooden rubble counters, and one stone rubble glued onto a Cellar counter. Other Miscellaneous use of the Light Blue pencil is on many of the weather counters as seen on the picture (Light Blue = Wind, Gusts, Overcast, Rain). Note also the home made enlarged weather counters and the Spotter Plane. 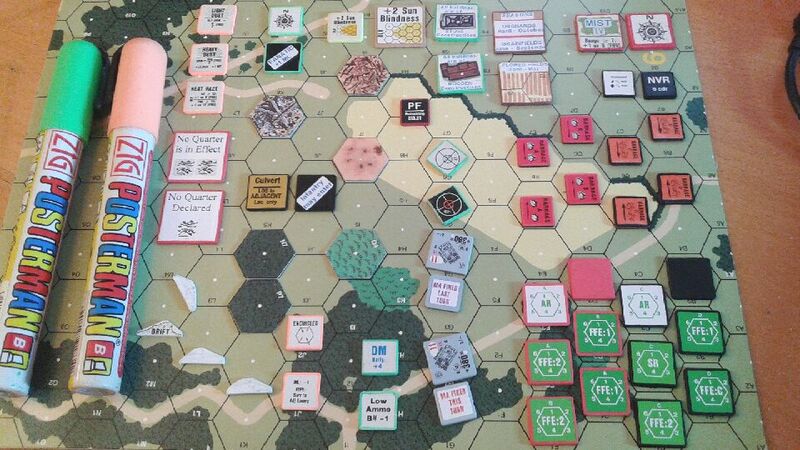 As can be seen on the picture, Blaze/Flame counters have been painted with red edges to enhance their red-burning-status, no benefit game-wise but it looks good, the same goes for the Melee/CC and H-to-H Melee/CC counters that has been marked red-bloodier-status, but do not that on the backside of the H-to-H Melee counters a red line has been drawn under the CC to easy know what is on the front side, the red line should be made with a red text marker (see #1 CX & HD above). The PIN counters have had their edges painted and game-wise it do enhance the PIN counter a bit and I like it since the counter stick out more than before and remind you that they should be removed at the end of the CC-phase. 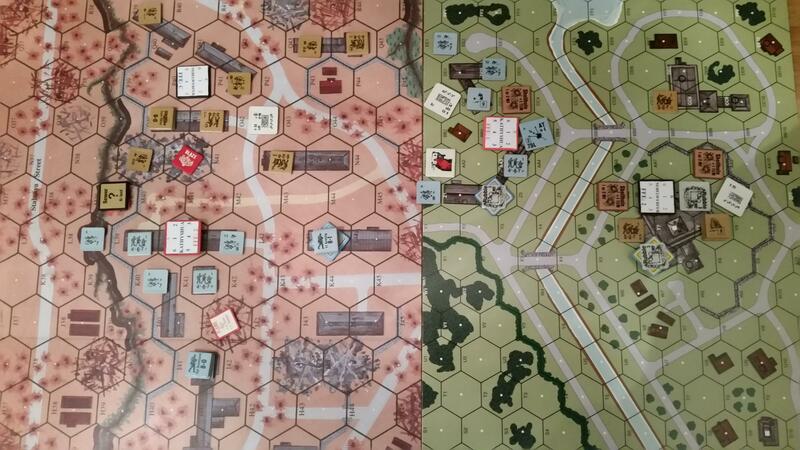 The Rage-counters BANZAI/LAX, HW Direction ->/Hex Grain Range and HUMAN WAVE/Hex Grain Range have been painted red, no real benefit game-wise, although it look nice. 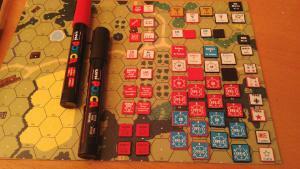 The Barrage counters have been painted somewhat differently, side A and B have been painted with red edge while the opposite side (C and D) have been painted with black counters (i.e., same counter have both red and black edges). Side A and B are used for the Allied nations and side C and D are used for the Axis nations. The Sewer counters can be seen to both have black and red edges, I have sorted down 8 Sewer counters with black painted edges and 4 Sewer counters with red painted edges in mine information Raaco storage. The point is that during your Movement Phase while you move a unit(s) in the Sewer system you also immediately roll on the Sewer Emergence Chart (B8.42), if you are not allowed to emerge the unit in the APh then place a Red painted Sewer counter atop the unit(s), but if you are allowed to emerge out of the Sewer system (happens more often) you place a Black painted Sewer counter atop the unit(s). Before you had to remember if the unit(s) was allowed to emerge out of the Sewer system or not (after MPh, DFPh, AFPh, RtPh have been conducted), or, of course, use some system to help you remember that Sewer unit could emerge or not emerge in the APh. The Red and Black DM+4 counters have been painted with black or red edges, these counters increased resilience due to the paint is good since the wear and tear on these counters are quite high compared to other counters in play, and it also looks good. The OBA counters A and B have been painted with red edges and C and D have been painted with black edges. 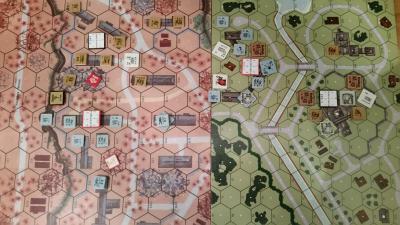 Long time ago we decided when playing Red Barricades that the Allied (Russian) player always used OBA counters with id A and B while the Axis (German) always used OBA counters with id C and D. That helps when playing scenarios when both sides have OBA in play, and there could be a question about which side the Spotting Round (SR) belonged to, and now they have also been painted in red (Allied) and black (Axis) to differentiate even further (also see #1 CX and HD, #4 SNIPERS that follows the same principle). The No Move/Parachute-picture counters have been painted with black edges, that makes the No Move side more darkish and give the Parachute side a nice black border, but game-wise there is no real benefit. 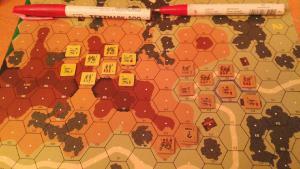 The BOG/MIRED counters have been painted with black edges, looks good. The TURN Markers have been painted Red on the Allied side and Black on the Axis side, looks good and give them hard edges that are resilience against wear and tear. Note that the Japanese/American Turn counters are homemade, the word "TURN" are DYMO Tape that have marked over the word "Location". As can be seen on the picture the two blazes in brush have drifting smoke downwards in the north direction and 5 dispersed smoke counters have been laid out, accordingly to the rules it should also be a dispersed smoke counter in the northern most blaze located in the brush, but since there can never be more than +3 DRM per Location then there is no need at all to place one in that Location. I have painted all edges of large Smoke and WP counters that has a white surface on both sides with a white paint-pencil, while, all edges of large Smoke and WP counters that has one of its side a white surface and the other side gray surface with a flash-yellow paint-pencil. 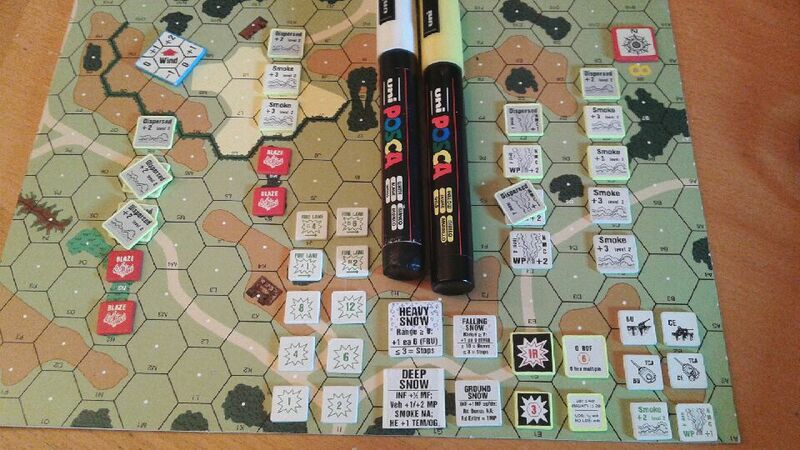 By doing so I can easily see the difference between the two types of counters, as can be seen on the drifting smoke counters from the two blazes in the woods Locations, you only have to place out 3 drifting smoke downwards in the north direction instead of 5 if they had not been painted with a flash-yellow paint-pencil. They should have printed all Smoke counters that are gray on one side gray on both sides instead of as now a strange mixture that makes no real sense, when you think about it (the same goes for the WP counters). The Residual FP and Fire Lane counters have been painted with white edges, look nice. The winter weather conditions counters as seen on the picture have been painted with white edges. Note also the home made enlarged winter weather counters. 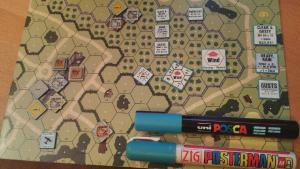 The WP counters on the picture should have one more dispersed counter in the hex there it now only is one white counters +2 DRM with flash-yellow edges (the colored edges tells you that it is the equivalents to 2 gray dispersed WP counters). The Smoke counters should have 5 drifting smoke-gray counters, but since they have flash-yellow edges painted 3 drifting smoke-gray counters is enough. 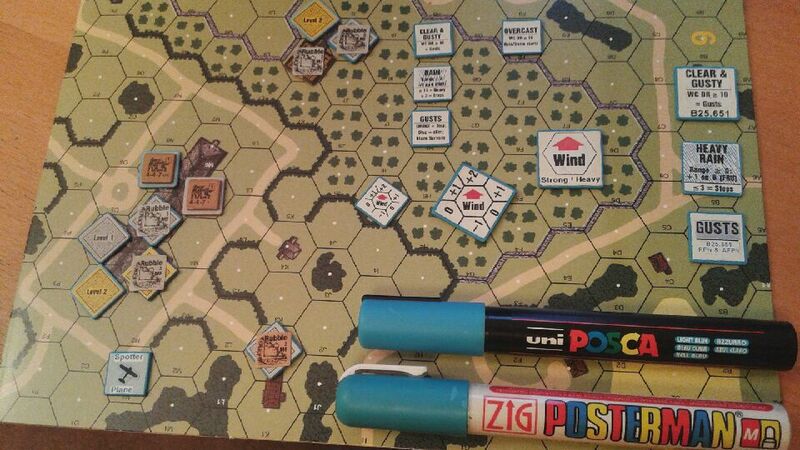 The IR and Starshell counters have had their edges painted in flash-yellow it not only looks good but also give the night scenario in play more flavor than before. The Non-Turret and Turret counters have been painted in white and also the smoke grenades that give them a nice touch. The Flash-orange paint-pencil has not been used very much at all, I only used it to paint the weather desert counters and the more common used Encircled counters that is good as they are highly highlighted on the battlefield playground. You can see the snowdrift counters cut down in size and during play is simple put alongside the hexside affected by these, they have been white-painted along the side and on the backside. To do this you either cut down original boat counters (if you have a double set) with a scissor or copy them and made some gluing onto counters you have no need of. The Culvert counters have had their edges and backside painted black, looks good. There are two Dense jungle, one Bamboo, one Shellhole, one Stone Rubble, one Wooden Rubble, this are simple added to this thread on how you can create your own overlays. The No Quarter counter can be used during play as a reminder counter, other counters used as reminders are the "All buildings are of Stone or Wooden Construction" and "Plowed Fields/Seasons" counters. Also the "North/MIST" and "+2 Sun Blindness" counters are seen as reminders. 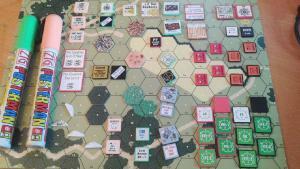 In Beyond Valor 3rd edition you get many blank German colored counters that here has been used to make the German customized counters "MA FIRED This Turn/Last Turn" to make them look more German, in original form they look just like any nation information counters which they are not. 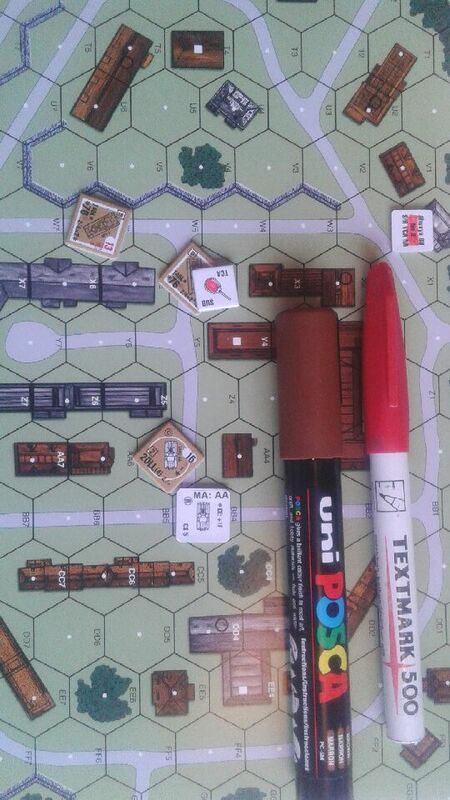 The Flash-Green pencil has not been used very much, it has been used to paint the edges of some acquisition counters and the DM +4/Low Ammo counters and in some more cases. The Artillery (OBA) counters has been described in point 7. (see above). As can be seen I have colored the edges of the FIRST FIRE / FINAL FIRE - ROF counter with a Flash-Green paint-pencil and the 2 Gunflash symbols have been colored with a Light-Green text marker and the backside single gunflash with a red text marker. A Dymo tape have been taped between the two gunflashes. 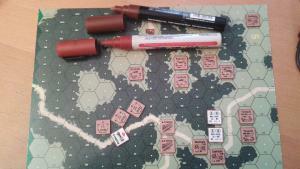 Have handed out more than 50 of these counters to more than 20 players and I use them quite often, although if memory serves me right it isn't really necessary but they can also be used to show which fixed CA the weapon that fired might have (point the two gunflashes towards the CA vertex) of course the same goes for other regular FIRST FIRE counters. The regular FIRST FIRE counter has its two gunflashes colored green, looks nice. The Gunflash on the backside of the PREP FIRE counter has also been colored green (Green= color code for MPh). The Roadblocks have been cut out with a scissor and works perfectly when straddled along the road hexside, looks nice and ease up the stacking-process during play. The Russian DUG-IN tanks have been created by color copy and enlarged 200%, Russian AFVs and cut out with a scissor and glued onto something to make it a bit thicker, looks good and ease up the stacking-process. Have only used this for the 5 different models you are able to purchase in Red Barricades, although once I had as a Russian player a captured German AFV as a Dug-In Tank. If you have a double set you can cut out the wreck side of AFVs with a scissor and use them as wrecks on the map, looks very nice. Only used this mostly when playing Red Barricades. The Bridges are handmade, ask if you meet me and I can hand you a couple already handed out these to over 20 players. 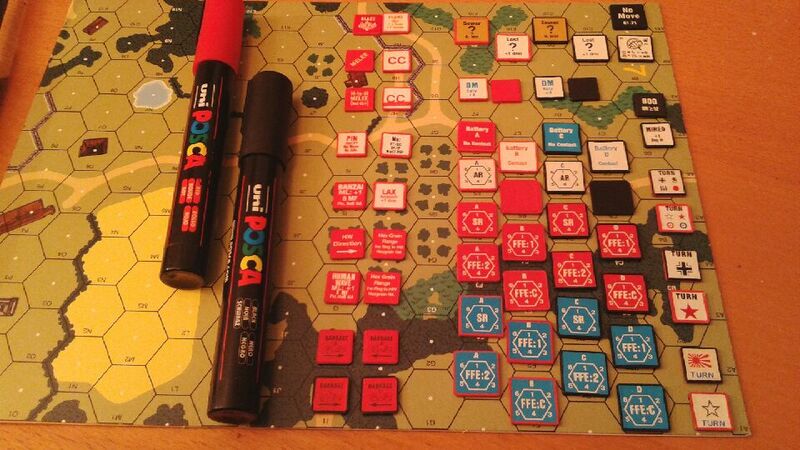 The British walking wounded MMC was painted red with a text marker and ease up the stacking-process since there is no longer any need to use the WW counters at all. The Black Waffen-SS was a complete unnecessary thing for MMP to produce (the only Germans with black uniforms were the panzer crews). Anyhow the quality of these black counters were poor and MMP decided not to give the leaders any names (I have), to improve the counters I painted all edges black, and used a red text marker to color the numbers on all MMCs and names on all Guns & AFVs, and also the wounded side numbers on the hero counter and the "7 morale" on concealment counters, looks nice and can be used when playing CG with the Waffen-SS so there is no need to wear and tear on my blue-blood Waffen-SS that I cherish more. Note that one of the German 8-3-8 and the 3-3-8 possessing a DC are BERSERK (and has no broken side) and their silhouttes have been painted red alongside with everything else, except for the SS symbol. Simple used a model knife and glued the HS picture on the backside of the Squad picture. The STUKA planes have had their edges painted black as all axis planes while all Allied planes have had their edges painted in red. En sammanställning av de pennor som används, från vänster till höger, sedan de två nedanför de elva ovan. Lysorange (flash Orange), Lysgrön, 2x vita, Gul & Brandgul (märks ingen skillnad), 2x Bruna, Ljusblå, Röd, Svart. Nedanför, Löv grön (ljusfärgad), Röd - dessa två täcker ej över när de används såsom målarfärgspennorna ovan gör. Alla pennor är vattenfasta, de elva pennorna har en kula i pennröret och skakas ordentligt innan användning. så ta med en penna så kan jag måla några stycken så får man se att jag gör ganska många stryckningar per bricka (uppskattningsvis ca 20-25 st stryckningar per bricka) det tar ca 40-50 sekunder per bricka, dvs att måla 10 brickor bör ta ca 8 minuter. 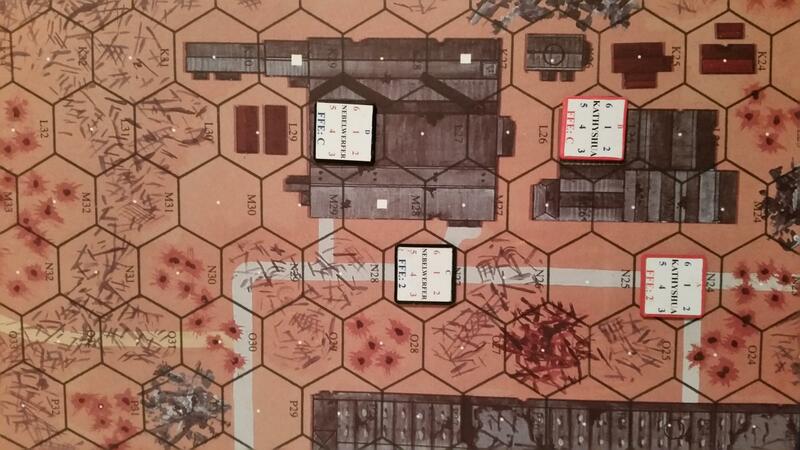 Dvs om du spelar ett ASL scenario som tar 6 timmar så bör jag samtidigt hinna måla 350-400 brickor, grovt beräknat. Att, använda de två icke-målarfärgspennorna som används till CX/HD & ASSAULT ENGINEERS & FIRST FIRE, PREP FIRE, går betydligt fortare. Edited by CTABKA, 05 November 2014 - 08:05 PM. "...ursäkta för stavfelen som går att finna på flera ställen ovan men eftersom det ej går att rätta felen när man väl har postat klart, så får det bli som det är...."
Jag har gått igenom texten och rättat dom stavfelen jag fann. Mel , har du några ideer om hur man skall hålla reda på om ex. en strv skjutit med sin kanon i first fire o håller på sina ksp ?? Lite för litet utrymme att skriva på countern tycker jag. Mel ige..... har du månne scannat in rubble från RB kartan o gjort overlays av dem ?? Det har jag nu är bara problemet att hur jag än scannar o vilka system jag än använder så får jag ta mig "#¤#"#¤%& inte ut dom i rätt storlek. Tänkte mest om du hade någon fil i datorn eller så. Jobbar på teknisk högskola med spelutveckling som en del av specialiteterna o vi hade en lärare för några år sedan som fixade det åt mig men han är dessvärre avflyttad. Har aldrig haft det i åtanke, har alltid kört på att man kommer ihåg , kan däremot lägga first fire brickan vid sidan av stridsvagnen om den har mer att skjuta med senare och vad det är har vi aldrig haft problem med att komma ihåg. Möjligen kan du klistra fast 'MA' mellan gunflashes såsom jag gjort med 'ROF' och även 'CMG' , 'BMG', AAMG det bör få plats. Om du tycker att det vore värt det. Edited by CTABKA, 01 February 2015 - 05:22 PM. Har tagit orginal kartor och klippt ut overlays ifrån och klippt isär Red Barricades kartan A23-A34 för att kunna lägga ut en skrollad karta, så man ej behöver vrida på kartan förrän tysken kan komma in längs hela kanten, nuförtiden med tanke på hur billigt det blivit med färgkopior , så färgkopierar jag red barricades kartan för att kunna klippa ut overlays rubble, shellhole, gutted buildings. Edited by CTABKA, 01 February 2015 - 05:24 PM. An jänkare och kanadensare asked after this counter improvement suggestions. Directed them to our web site. Edited by CTABKA, 01 April 2015 - 09:36 PM. Förbrukade ca en halv rulle dymo tejp. normal längd på kanonrören (ej 76*mm korta pipor). två Sub-Turret med den röda Text mark 500 för att lättare skilja ut dem från vanliga turrets. Om man vill kan jag dutta på dina två ryska AFVs, när vi ses på SAT, ska försöka komma ihåg att ta med mig pennan. FlaK vagnarna har även de fått sin errata påklistrad. Edited by CTABKA, 04 April 2015 - 11:24 AM. 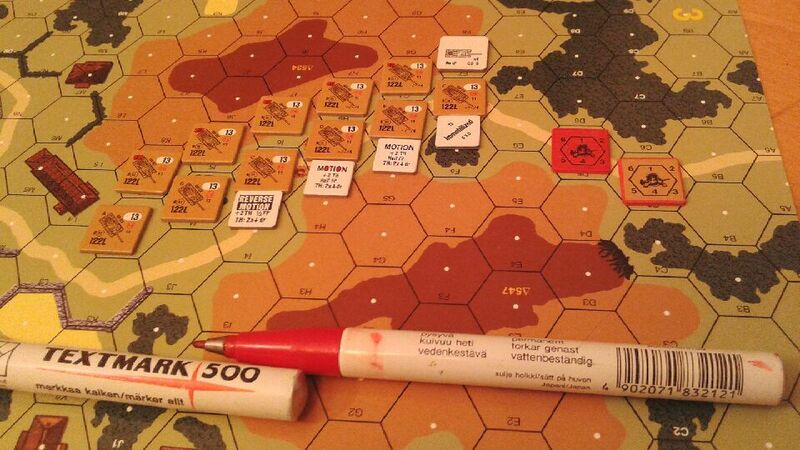 Rocket FFE counters, Kathyshua/Nebelwerfer: vi brukade förut använda en octagon (8-hörning) som bestod av en blå FFE med en röd FFE ovanpå för att representera ett batterI som avger raketbeskjutning. Nu har det ersatts med en bricka FFE:2 <> FFE:C (två ryska och två tyska) som minskar stacking och är något större än en 5/8 inch counter och även har en ljus/ovanlig färgsätting som kommer synas bra på kartan. Edited by CTABKA, 16 February 2016 - 09:21 PM. Funderar på att starta med detta , men varför blått på level-counters , varför inte den färgen som själva brickan är gjord i , dvs gult på level 2 o grått på level 1 (eller syns grått på tok för dåligt) ?? Gult används redan till dispersed SMOKE (inlägg 12). Grå kant blir allt för likt stone Rubble (se exempel i inlägg 10). Blå valdes när jag först målade Level brickor precis för att särskilja dem åt när en enhet var placerad på stone rubble eller 1st Level efter några missöden. Blå är även en färg som lätt syns.